Simplex Americas LLC is an exclusive supplier of Simplex-Compact steering gear and fin stabilizers. These top of the line steering gear products can provide many advantages and are available for a vast number of vessels. Whether you need to prevent your vessel from rolling in rough waters or need something compact to save space, Simplex Americas LLC has a solution to fit your needs! Multiple levels of redundancy are used to enhance overall parts of steering gear reliability. Additionally, this unique enhancement simplifying your maintenance requirements and helps to decrease your maintenance cost. In turn, keeping your expenses low! The optimization of linkages can produce less overall stress in mechanical parts of steering gear components. This product feature can also enhance reliability and durability of your steering gear parts, again saving you money overall. This distributed control system provides control from five different operating stations, making an expansion possible. In other words, it offers greater flexibility and stability, which is critical in these types of settings. The high-performance, closed-circuit hydraulic control systems further enhance the reliability and precision of our first-rate fin stabilizers and steering gear, therefore, helping to prevent a loss of valuable time and money for you and your business. Simplex Americas LLC’s steering gear equipment is specifically designed for economic power consumption and to require a minimal amount of space for operation. The compact designs and low power requirements make these steering gear components among the best in the marine industry today. 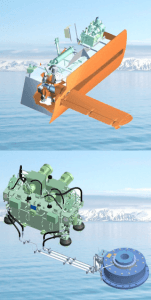 Contact Simplex Americas LLC today via our website or call 1-908-237-9099 for more information on our steering gear products, such as Simplex-Compact steering gear and fin stabilizers.